If this is your first time visiting our site, you may not realize that we are constantly adding new Orlando area vacation rentals to our portfolio. We appreciate you choosing Reunion Vacation Homes and we want you to feel that you have a large selection to choose from; the more options you have the more likely you will want to come back again! Nothing is more frustrating than finding the home you love and discovering that it is booked for the next three seasons. With Reunion Vacation Homes, we will ALWAYS have something comparable or even better than the home you rented last year! Additionally, theres just something wonderful about that new rental smell, don’t you think? If you aren’t new to a Reunion Vacation Homes rental, you will understand what we say when we tell you that ALL our Orlando area vacation rentals will exceed your expectations in quality, comfort, and décor. There’s always something that seems unique about the new, however. Like the beginning stages of a relationship, everything seems brighter and more amazing. 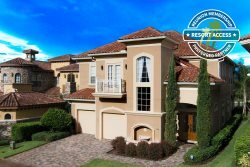 For example, let’s take a look at one of our newest vacation rentals in the Orlando area, Castle Pines Paradise. This villa is located off the 2nd hole of one our favorite local golf courses. Featuring four bedrooms and three and a half baths, your vacation will only be improved by staying here! Tile floors, stainless steel appliances, and a private pool with hot tub and basketball net all combine to create a haven you will never want to leave. The indoor/outdoor lifestyle is very important in Florida and the oversized arcadia doors in the living room make it easy enjoy by sitting in a comfortable patio chair, reading a good book, and drinking a frothy margarita. THIS is why you chose Orlando for your vacation destination. The bedrooms are bright and spacious sanctuaries of peace and light, the bathrooms large and spa-like, and the jetted corner tub in Castle Pines will soon become your favorite spot! While you may want to spend your entire vacation lazing around in your new Orlando area vacation rentals, it would be a shame to come all this way and miss out on the sights. Visiting the Charles Hosmer Morse Museum of American Art, for example, is one of our favorite ways of spending a few hours away from the office. Their collection of Tiffany Art Glass is incomparable! Sunny afternoons spent exploring Lake Eola Park relax and rejuvenate and offer wonderful photo opportunities. The swans that make their home on Lake Eola are just as breathtaking as you always imagined! Whatever your vacation interests are, you’re sure to find something that tickles your fancy when you visit Orlando! Paradise in Patriots Landing - Brand New 5 Bedroom Pool Villa with Games Room! Key West Villa | Minutes to Disney | New 5 Bedroom Pool Home with Games Room!